Summary: This walk is normally a moderate walk from Kettlewell in Upper Wharfedale with a reasonable climb over Old Cote Moor to Arncliffe in neighbouring Littondale before following the River Skirfare downstream to Hawkswick and then ascending gently over Hawkswick Moor via Knipe Scar back into Upper Wharfedale. At 6.6 miles I would expect to do the walk, including 20 minutes for a bite to eat, in around 3 hours. Along with my brother Dave we took 5, almost half the pace we usually manage. One factor was unfitness, this being the first walk of the new year (2010) after the Christmas and New Year indulgences. 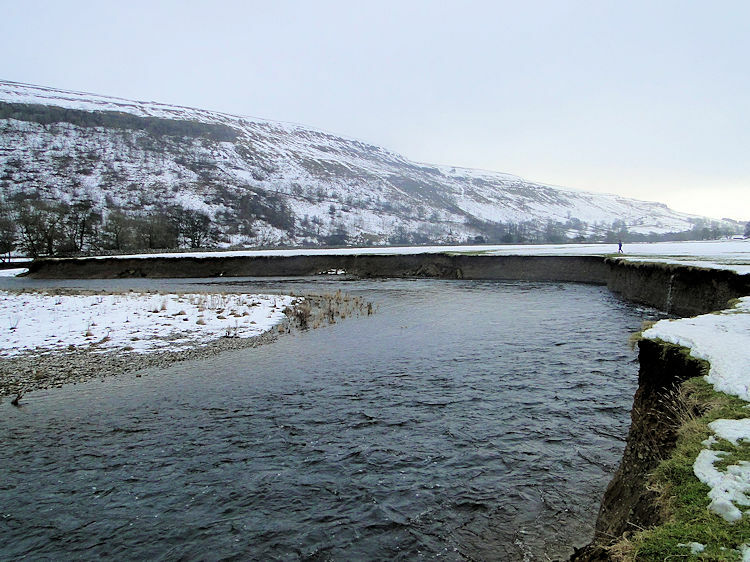 The other were the snow drifts remaining on the moor after three weeks of winter weather which had caused widespread disruption throughout the country. It was hard but it was great fun. Winter 2009/2010. 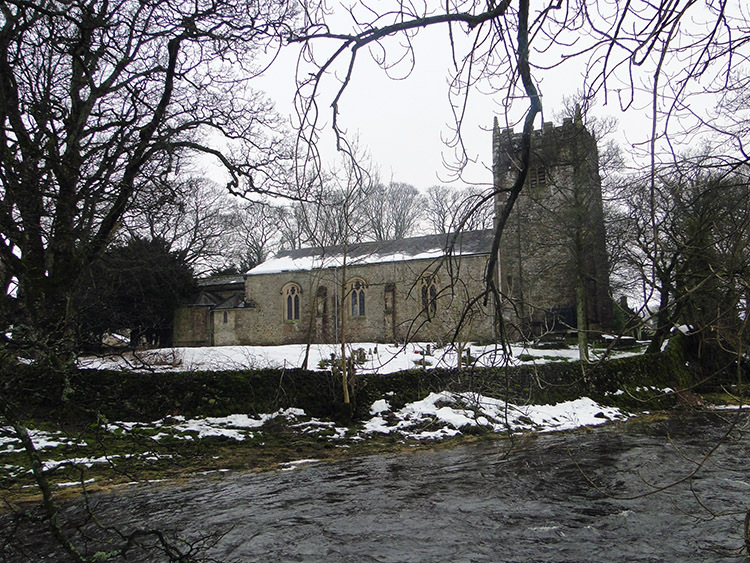 The snow began the week before Christmas and a heavy downfall on Christmas Eve blanketed all of North Yorkshire. It was beautiful and although it did not snow in my hometown of Harrogate on Christmas Day it was as good as an official white Christmas; in fact it was better as the sun shone brightly on the festive day making for a fantastic walk which we had with all the family. Then around the turning of the year the heavy snows came again which resulted in picture postcard images for a good three weeks. 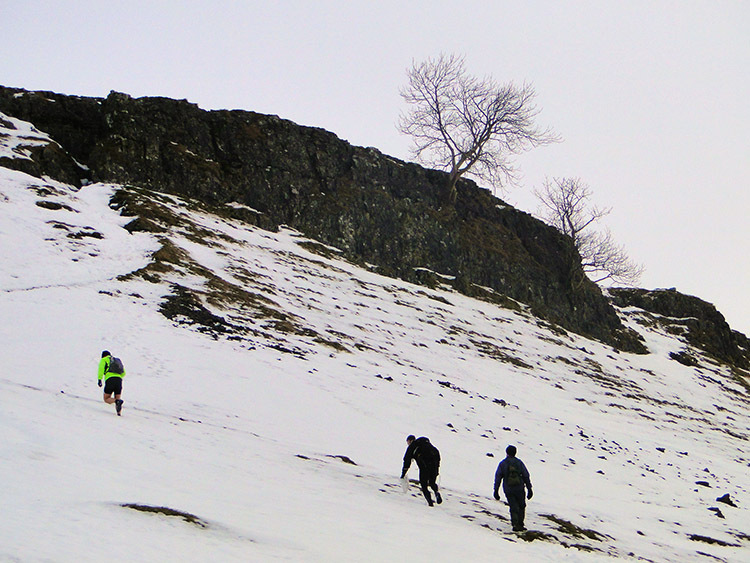 How I itched to get out in the hills before all the snow was gone. Family circumstances had made it impossible before Sunday 17th January and as the snow was melting and gone from below 1,000 feet by then I contacted Dave and we agreed to go. 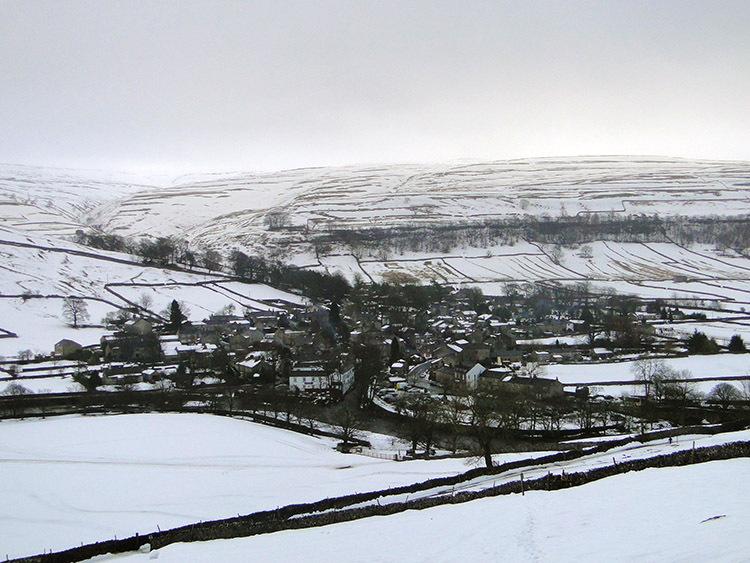 Driving from Harrogate to Kettlewell we hoped for sun and a decent blanket of snow in Upper Wharfedale. 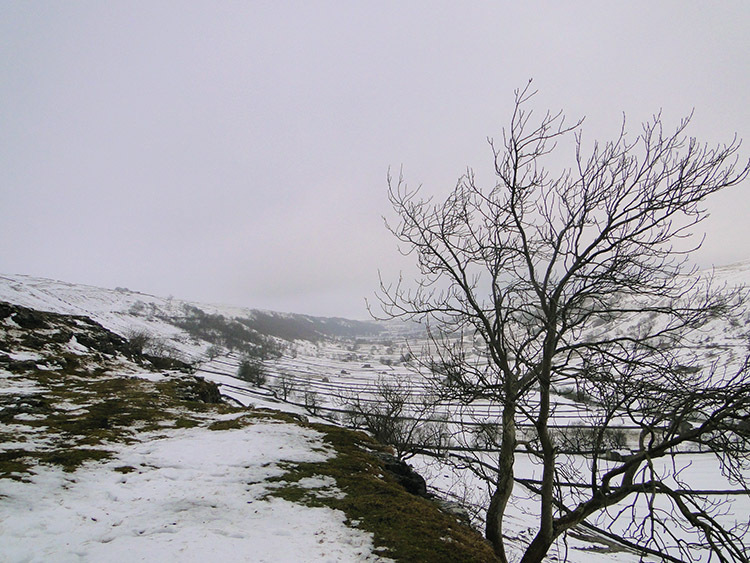 Concerningly, the snow on Blubberhouses Moor at around 1,000 feet was very patchy and on Embsay Moor too. 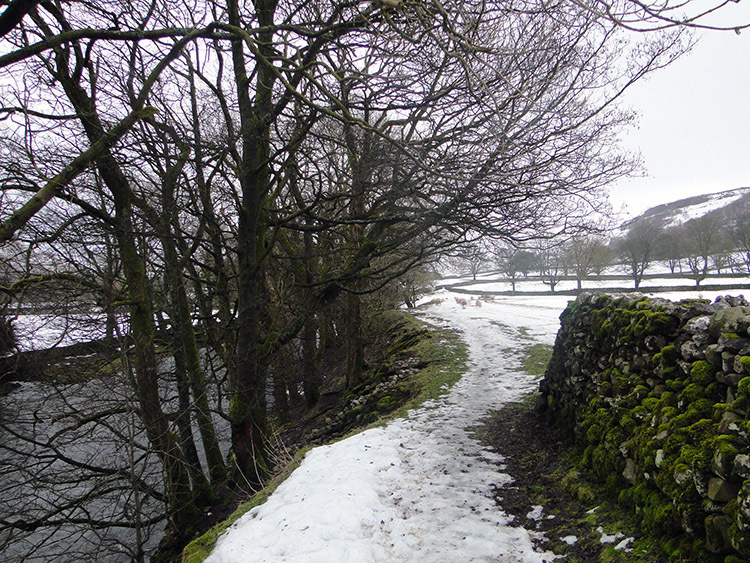 As we climbed from Grassington into Upper Wharfedale though the hills were much whiter and snow more widespread too. We had not missed out. I had climbed up the track from Ketllewell to Gate Cote Scar on the lower heights of Old Cote Moor many times. It is a tough little section, immediately testing the leg muscles in a short sharp 80 metre ascent. A quick awakening to any walk but this time I was trudging in forgiving snow. On each step I had to haul my foot above knee height of the other to clear the snow level before placing it on fresh snow that gave way on contact. Dave and I looked for other walkers footsteps so as to follow them exactly. A group of three walkers on the ascent with us did the same but whereas the previous walkers steps we did find helped in one way they were a hindrance in another. Many had collapsed into a slide. It was simply the hardest ascent I had made of this notable track. 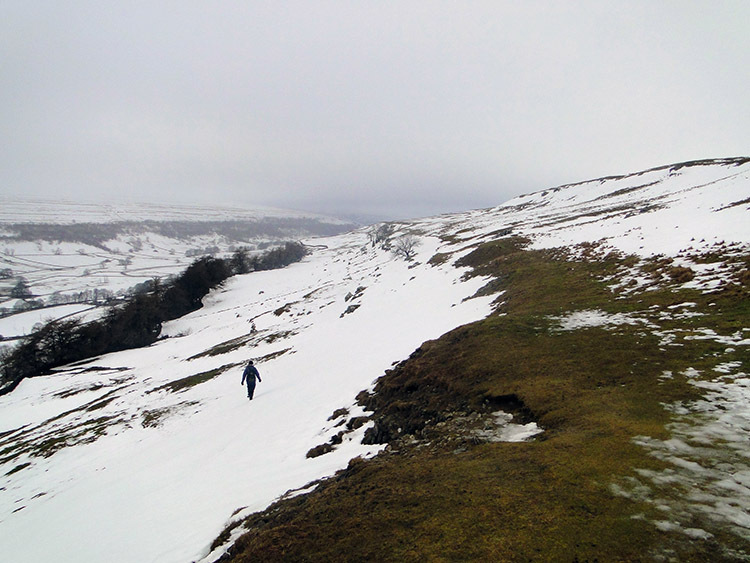 By the time I reached the top of the crevice through Gate Cote Scar I was exhausted. I declared myself very unfit! Fortunately, once on the level above Gate Cote Scar the views were utterly spectacular. 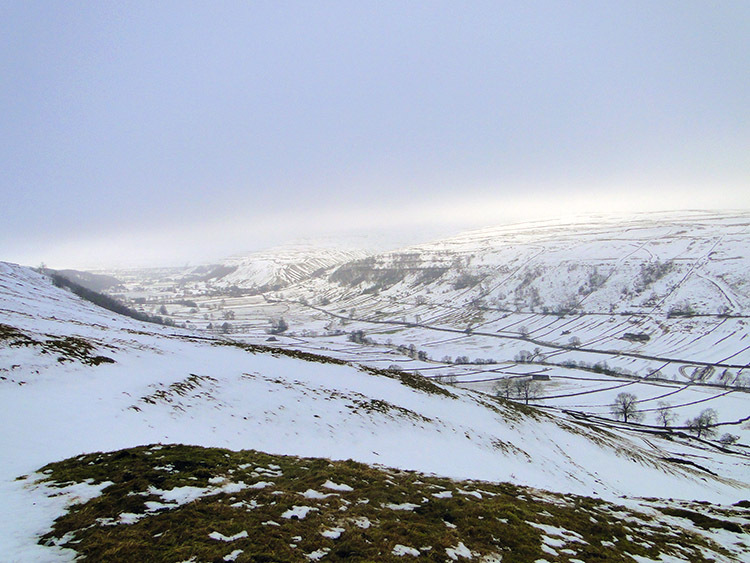 Snow lying on hills make them somehow different and as if nakedly forced to reveal their distinctive contours. 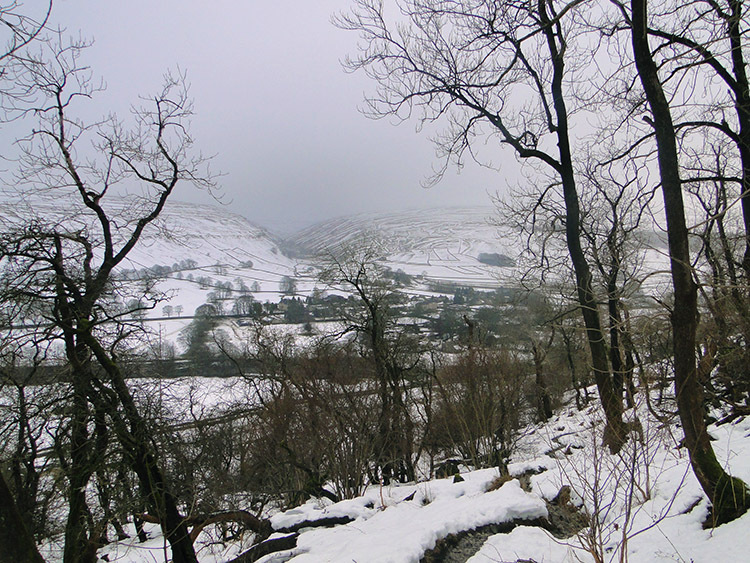 My needed rest was supplemented with taking a plethora of panoramic photographs. After the break on Gate Cote Scar we continued on our ascent of Old Cote Moor. Unlike the moors seen on our drive over to Kettlewell from Harrogate, Old Cote Moor was completely covered in white. To our left, on the east side of the moor a farmer had made his way up onto the middle moor with hay for sheep who assembled in orderly lines to take their fayre. Ahead of us the three walkers we had met on the first climb were struggling onwards up the moor. The one to the rear sometimes reverted to a crawl but he steadfastly continued in the train of his mates. They got further and further distance as Dave and I made a slow steady progress. It was still hard work, oh so hard, but somewhat sadistically I was enjoying myself; I kept reminding myself I needed the hard walking and that it was my own fault for not getting out sooner. After a few false tops, that is the nature of Old Cote Moor, it fools you with hollows and steeps until you reach the true ridge top, we did reach the ridge plateau and on consulting my new Memory Map Adventurer 2800 GPS unit I confirmed to Dave that we needed to walk directly over the ridge via a stile to begin our descent into Littondale. 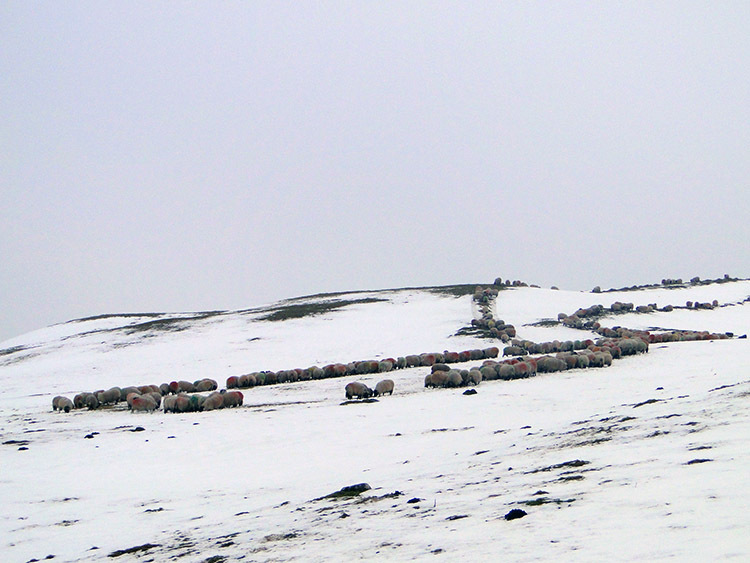 Before we descended we met a group of four who were equally joyous to be out in the snow laden moors. They were chuffed they had just stumbled across a deer a little earlier. It was to evade our eyes. 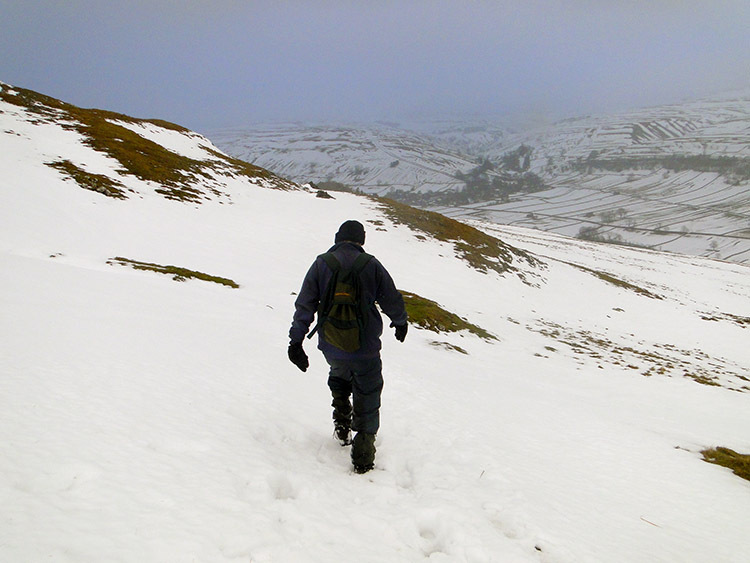 Dave and I made our way down from Old Cote Moor toward Littondale not fleetingly, but very steadily. It was not possible to walk at pace for the ground was slippery amidst and under the snow; certainly more treacherous descending than ascending. Dave took a tumble soon into the descent that cracked his frozen shoulder. He was pained for a few moments. We were very careful from then on. On top the fog had closed in, it was close to white out but as we lost height Littondale came into view, vague at first then more clear. More time for short halts and photo snaps. They were regularly taken. 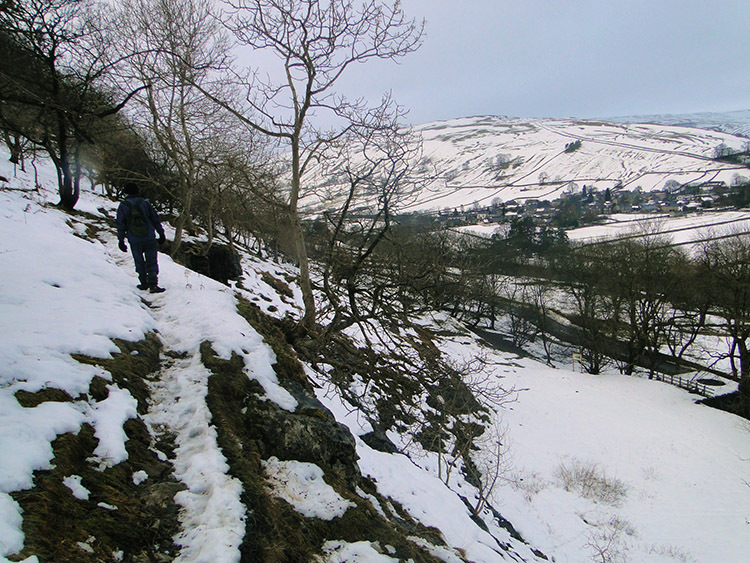 Some time later we came to Byre Bank Wood which overlooks Arncliffe and climbed over a stile into the tree boundary. We carefully made our way down a steep track that also serves in part as a watercourse. It was a lovely change from the white covered moor we had spent our time in for the previous couple of hours. The wood also offered us the first opportunity since the outset to walk on firm ground. The snow was mainly absent from the wood. On emerging from the wood we crossed a couple of small fields then the Litton Road before crossing a final field into the village of Arncliffe. We did not bother going into the village centre, deciding to stop for lunch on a bench by some old punishment stocks in view of Arncliffe Church. As we ate a Robin stared at us so I took a sandwich crust over to his perch. Naturally he hid while I did so but on leaving I noticed him come back for his reward. Good for him I thought as we wandered off from the village to follow the River Skirfare downstream to Hawkswick. Dave was fair bounding along now and led me by 100 metres or so. I made no effort to catch up as I regularly stopped off for photograph opportunities such as those on this page of the River Skirfare and Blue Scar. During this part of the walk I felt much stronger, the walk over the moor, painful as it was had hardened my muscles and the food intake had clearly refueled me. Pah, I though, what a wimp I was earlier! Continuing along the bank of the Skirfare then across fields to meet with the river once again at Grid Reference SD492711 I revelled in my new found strength. At GR492711 I stopped in my tracks though as I thought I heard thunder. How come, there was cloud yes, but not the type for a burst of thunder. Yet, it continued, a regular noise which I investigated further. Looking to the near riverbank gave me the answer to the mystery of the thunderburst. 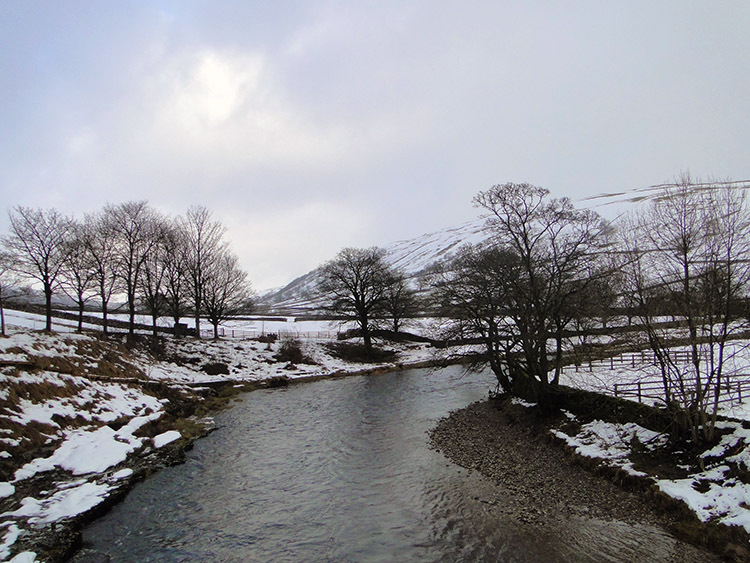 The thaw was set in now and melting snow from the upper fells had bloated the waters of the Skirfare. On the river bends the rushing water was quickly eroding the bank and the field we were walking across was getting smaller and smaller as it collapsed into the river. Fresh falls of topsoil toppled into the water and on the bank revealed the carnage. Huge areas of grass sods were hanging loose with no soil under; this was not a time for walking too close to the bank. I watched for a good ten minutes. It was mesmerising. Eventually I turned and continued on, the further I walked, the more the thunder dulled. I'll remember that moment for sure. Soon after I caught Dave up at the footbridge over the river near Parracks Barn. He was chatting to some council people from Bradford who told him of the travails in Bradford with the recent snow, black ice and gritters. Snow makes headline news in the UK, always. After his chat with the public sector folk Dave followed me across the footbridge and then along the road into Hawkswick. I was feeling good now but neither of us were too keen on the ensuing 170 metre climb from Hawkswick to Knipe Scar which would take us back to Wharfedale. It had to be done though and I led us from the road and up the track towards the scar. Dave admitted his fatigue at this point so I soldiered on, slowly but steadily up keeping a pace to which Dave comfortably matched. As we do, if one gets too far ahead he waits for the one behind. He did for me on the climb onto Old Cote Moor. 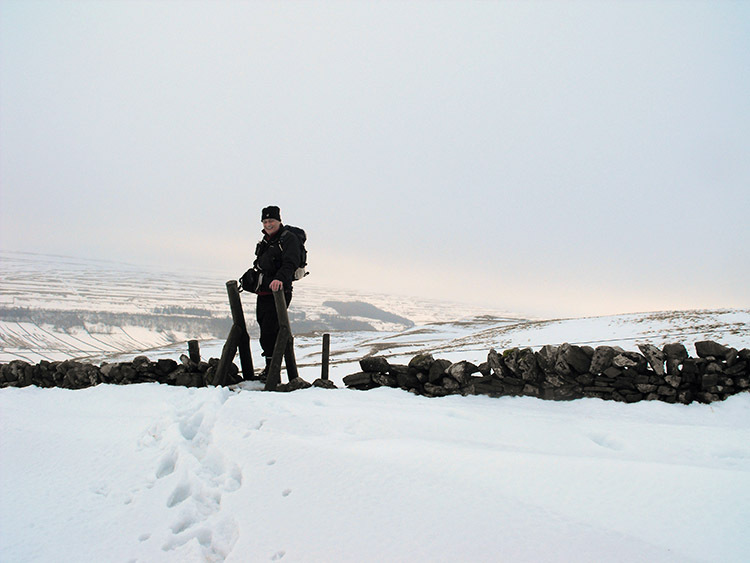 Stating his struggle, I told him I was not exactly bounding up either as on old Cote Moor the snow and drifts were not allowing us to do so. But relentlessly we went and as always we reached our highest point before making a short plateau crossing to a stile over a wall which was a straight walk over. Snow had drifted to wall height on both sides; effectively there was no wall to see and I decided to get out the camera and take a photograph of the drift. In haste to take out the camera the lens flew off and down a snow crevice between wall and retreating snow. It was too deep to reach and as I tried to dig it out snow caved in completely obscuring the lens. After a good five minutes of digging with gloved hands getting colder and colder I had to give up. The lens cap was lost. If you find it, keep it as a memento, I now have a replacement. However, it was an expensive photograph! Irked I followed Dave down from Hawkswick Moor to Knipe Wood, again very gingerly as slipping was all too easy on the steep descent which fell off to our right. 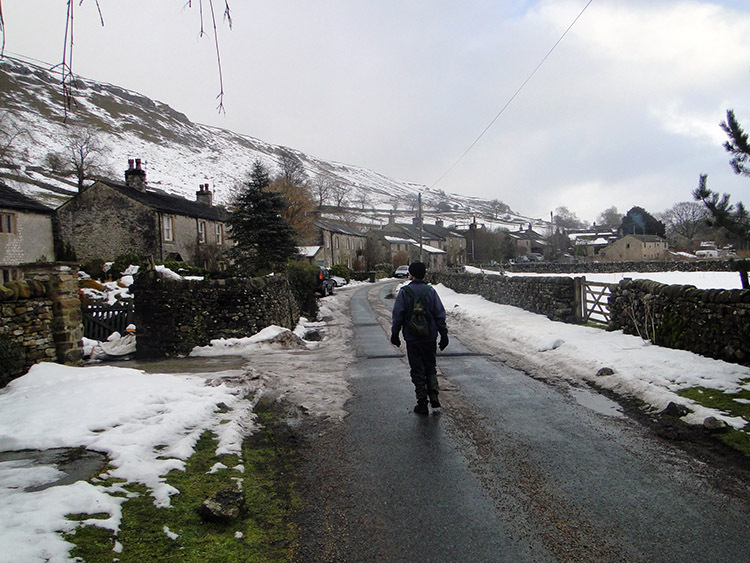 After a walk through the wood we reached the Grassington to Kettlewell road and walked back to the car. We both agreed the walk had been a fantastic experience. 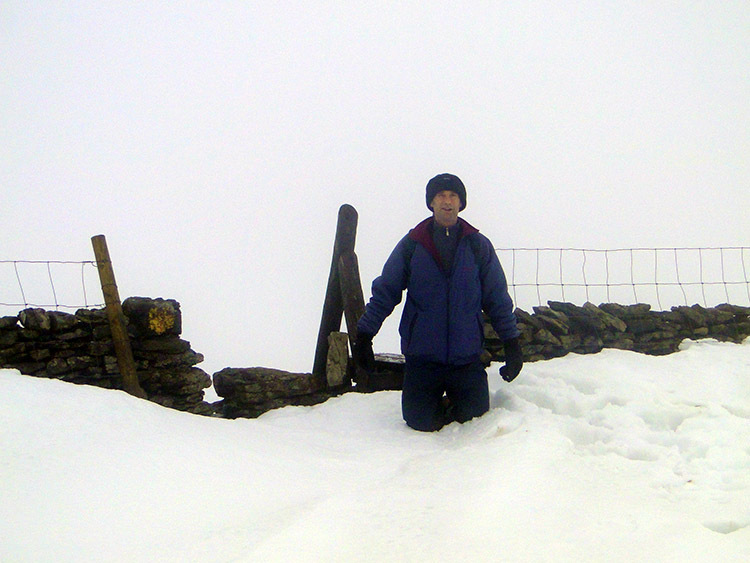 It was the best way to start the walking in 2010, a remarkable day out despite the difficulties. The harder the walk the better, is not that the case?